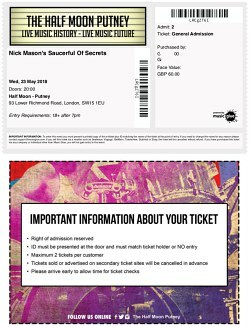 This review of the third night of Nick Mason's Saucerful Of Secrets "global tour, playing both Camden AND Putney" (as Nick amusing put it) should be read in conjunction with the review of the first night at Dingwalls. Most of the comments within that, apply equally to this show. Rather than repeat ourselves, if you've not read that one, scamper over and take a look now. Well, night three of the "tour", and the second night at the Half Moon. Gone was the amusing, low key chalkboard outside advertising the show (spirited away by an errant souvenir hunter?) but nonetheless those seeking their musical thrills still managed to find the venue with little difficulty. The queue to enter seemed to start earlier this evening, a sign of things to come - the audience for this show proved to be really "up for it", with a palpable energy and enthusiasm which seemed to help propel the band along. Part of the joy of live performance is the unpredictable nature of it, and thankfully the band were able to laugh off the false start to the show. This was a result of the small stage dimensions, with Dom Beken having to wriggle through a small space to emerge amidst his keyboards - it looked a bit like a 3D version of Twister to get there - and in the midst of this, a vital connection was knocked out. Assuming the band tour, one assumes it will be in venues with stages that give a little more space, meaning this sort of thing is much less likely! Once fixed, we all pretended that the band had literally just walked onto the stage, and the show started properly. As mentioned above, the band really seemed to feed off the energy from the audience, and it did seem to take the performance to another level. They really seem to be getting better and better, as each show takes place, possibly working with audience feedback as to what works best in each situation. So, show three done, three quarters through the aforementioned global tour, and a further 250 very happy souls thankful that they were there at this most unexpected of venues to catch a member of Pink Floyd, and his excellent new band, performing. 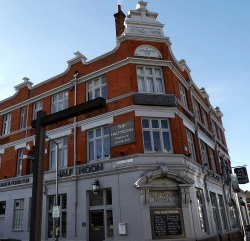 Some of course will be lucky enough to be at the final night, also at the Half Moon. If you are, enjoy (we're sure you will!) and let us know your thoughts on it.